I read a sobering article last week about how technology is slowly eating away at midpay jobs--the kind of employment that furnishes a middle-class lifestyle. The AP's "Holy Hal! A Robot Stole My Job" notes that "In the United States, half the 7.5 million jobs lost during the Great Recession were in industries that pay middle-class wages... but only 2 percent of the 3.5 million jobs gained since the recession ended in June 2009 are in midpay industries. Nearly 70 percent are in low-pay industries." What is happening to those middle class jobs? Says the AP, "They're being obliterated by technology." The article reminded me of another I read in 2011, "Why Software Is Eating The World." It was written by Marc Andreessen, the visionary who co-developed the first widely used web browser and founded Netscape. He saw a technology-filled future with plenty of opportunity and jobs. Andreessen said we are "in the middle of a dramatic and broad technological and economic shift," that made him "optimistic about the future growth of the American and world economies." So, whose future is correct? The AP's dystopian future or Andreessen's rosy one? Perhaps both--it may be a sad reality that economies can thrive by many measures while large numbers of citizens remain unemployed or find themselves shifted to lower-wage jobs. Just look at last week's financial news--the S&P 500 rose above 1500 for the first time in four years, and unemployment claims also fell to a five-year low, but the overall unemployment rate remains more than 50% higher than at the beginning of the Great Recession and more than double what the US experienced during the roaring economy of 2000. Meanwhile, median household income after inflation fell to a level 8% lower than in 2007, and the gap between the wealthiest and the rest of Americans grew, with income for the top fifth of American households rising by 1.6% last year compared to declines for households in the middle. Many forces are altering our world, and technology is at the center of them. In fact, this has been the case for at least the last 150 years. In the mid-Nineteenth Century, 90% of Americans worked in agriculture and related fields, and today, that figure is only around four percent. In 1900, only 5% of the nation's factories used electricity to power machines and just 10% of its homes had electricity--a century later, electricity was universal for both homes and manufacturing. As technology changed the way we worked, it also effected the way we lived. 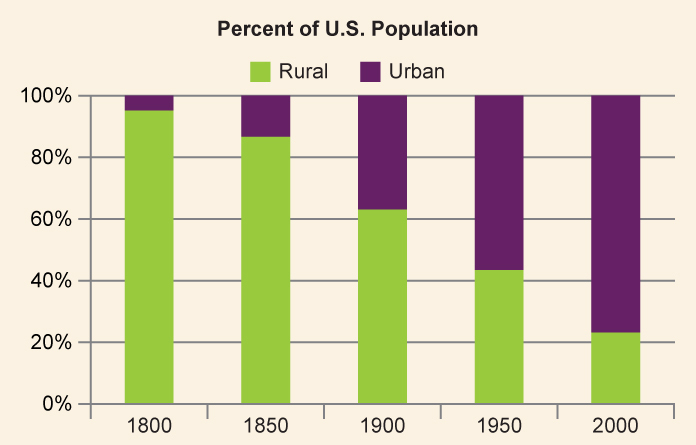 In 1800, over 90% of us lived in rural areas; today, around 80% of us live within metropolitan areas. Technology altering how we live, work and earn money is not new, but there are some profound shifts underway today. When I first read Andreessen's optimistic article, I feared he overlooked the way his software revolution was creating two very different classes of employee; in fact, his article brought to mind a vision from Fritz Lang's striking 1927 film, Metropolis, where the managers live luxuriously above ground while the workers toil in horrifying conditions beneath the surface of the planet. Andreessen does not seem to mind--or at least does not have an answer for--the duality his technology creates. He notes, "Many people in the U.S. and around the world lack the education and skills required to participate in the great new companies coming out of the software revolution... (They) will be stranded on the wrong side of software-based disruption and may never be able to work in their fields again." Too bad, so sad, Marc? The recent AP article notes that technology in the workplace has not been a zero sum game--even in just the last few years, tech has created winners and losers. "Companies in the Standard & Poor's 500 stock index reported one-third more profit the past year than they earned the year before the Great Recession. They've also expanded their businesses, but total employment... has declined by a half-million." The winners of the economic shifts of the past six years have been stockholders and tech employees while many others are losing out. For an example of how technology has changed an industry look at Amazon, which Andreessen praised for evolving "while Borders was thrashing in the throes of impending bankruptcy." Amazon is one of the greatest success stories of the past two decades, but its success did not come merely by embracing new distribution methods but also by eliminating costly, wage-earning, benefits-demanding workers. Borders is gone, leaving 20,000 local retail employees without jobs, and more than 1,000 independent bookstores closed from 2000 through 2007, leaving about 10,600 unemployed. Meanwhile, printing employment has decreased a whopping 23.5% in just five years, and that drop is bound to accelerate in the next few years thanks to the adoption of new tablet hardware--IDC forecasts worldwide tablet shipments will be 40% higher in 2013 than in 2012 and will more than double last year's volume by 2016. The employment shifts are not just limited to Amazon and books, of course. Look at Netflix, which employees 2,400 people but has almost single-handedly put 7,000 video rental stores out of business and forced Blockbuster to decrease its workforce from a peak of 60,000 in 2004 to little more than 4,000 today. Or Pixar, a company whose creative output I revere, but which has also replaced scores of animation workers with more powerful, flexible and efficient animation technology. Or online photo distribution sites that replace photo process workers. Or digital music systems that replace those employed in CD production, distribution and retail. Computers may even replace those jobs you might have thought safe in our digital world. Did you watch IBM's Watson beat Jeopardy's two biggest all-time winners? How might organizations put that same sort of artificial intelligence and computing power to work? Robot journalists? Robot soldiers? Robot investment managers? What about the jobs of the 2.3 million people in the US employed as customer service representatives? IBM notes that "one of the first real-world applications of Watson’s technology" will be in customer service, and an IBM CTO dares us to "Imagine if you had a system where you just called Watson, asked a question, and you get the answer in real time." What I imagine is 2.3 million more people losing their jobs, many shifting from middle-class jobs to something less. So are many of us doomed to end up out of work or under-employed as workers maintaining high-efficiency robots and computers? I think that is up to us in large part, because we do have a weapon at our disposal: A deep, ongoing commitment to learning. The idea that education in our teens and 20s will prepare us for lifelong employment is as dead as, well, Borders book stores. John Dewey, an education reformer a century ago, recognized this well when he said, "Education is not preparation for life; education is life itself." How many of us are using today the things we learned in school? Heck, how many of us over 35 are using the same skills that propelled our careers just 10 years ago? And while technology may be increasing the speed of obsolescence and the need for constant learning, even tech jobs are not immune. In fact, the commitment that technology workers have to maintaining their own skills has more to do with their relevance and employment today than the fact they have dusty certificates attesting to their knowledge of COBOL, NetWare, ColdFusion or C++. Software and hardware can replace humans in some tasks, but not all. They cannot inspire others, envision the future, be creative, entertain or apply judgment. A computer may be able to do what a customer service rep or paralegal does, but no amount of hardware or software will ever accomplish what Steve Jobs, Jeff Bezos or even, for that matter, Marc Andreessen have. Steve Jobs, who perhaps has done more to advance technology in our lives than anyone in generations, still recognized the vital importance of good people: "The most important thing is a person. A person who incites your curiosity and feeds your curiosity; and machines cannot do that in the same way that people can." Do you incite curiosity in others? Do you want to change the world? Are you committed to learning every year, every week and every day? Can you discuss the changes that occurred in 2012 within your industry at the same length you can the 2012 record of your favorite sports team or last season's outcome of your favorite reality TV program? My guess is that today, more Americans can name a greater number of people Taylor Swift has dated than they can thought leaders in their own industry. In his 2005 best-seller, "The World Is Flat," Thomas Friedman notes, "In China today, Bill Gates is Britney Spears. In America today, Britney Spears is Britney Spears -- and that is our problem." Visit LinkedIn every day as a news source. You can find a lot of interesting web sites and blogs to which to subscribe, and sites for professional associations are also particularly good for career oriented news and information, but many overlook one of the best professional information sites around--LinkedIn. The company has been busy improving the discovery of content with LinkedIn Today and new Original Content, and while many of the LinkedIn communities can be spammy, you can also find terrific, well-managed communities to join. Schedule non-work time for career learning. If you can make time for "appointment TV," then make an appointment with your career outside of work hours. Once or twice a week, schedule time on your calendar to read. If you focus your research on where you want your career to take you in two or three years, this habit will help you get there. Don't overlook books. I'll admit I can be guilty of this one. In our mile-a-minute culture, it can seem that today's blog post is more relevant than a book published last year, much less last decade. While books may not be a source of the most recent case studies, great books do more than just furnish fresh stories--they can inspire new ways of thinking. For example, Groundswell by Charlene Li and Josh Bernoff may be several years old, but its approach to getting social media right is still as solid as ever. Find out what your boss or others in your company are reading, or ask them for a book recommendation--this can provide good reading and good professional bonding. Better yet, seek out or start a professional book club where you work--that is something no robot will ever do. Create a professional Twitter list and follow some industry leaders on Facebook. Twitter is fun and informative, but its damn noisy. I long ago stopped paying attention to my tweet stream and instead focus on lists. Create or subscribe to a Twitter list of some of the best thinkers, research firms, professional associations and publications in your industry and check it daily. Don't forget Facebook, which has been making inroads to the professional networking space. Whereas two years ago almost none of my professional networking occurred on Facebook, today I'd estimate a third does. Instead of friending people you do not know, follow them, instead. Write a blog. I made this recommendation in a recent blog post, so I won't repeat myself here except to say that consuming news and information is helpful, but it is much, much more powerful and beneficial for you to turn that into your own ideas, insights and recommendations. You and I cannot change the course of the world or alter how technology will impact the lives and wages of workers, but we can change our own course. If we are hurt by the fact we fail to keep our knowledge, skills and abilities current, that is not the fault of our employer's training programs, bosses, government agencies or our education system; the fault is entirely our own. The robots are waking. They have already killed slower gazelles. And they are getting faster every day. As always, you've given me a lot of brain food to chew on here. Nice job! It's interesting that you referenced Metropolis and the duality of technology. I recently listened to an audio drama version of one of my favorite novels, The Time Machine by HG Wells. What resonated with me more than usual was the unsubtle earnings Wells was prognosticating. In Wells' vision, the division between the labor and leisure classes was not theoretical. It was a real thing that led to so much social stratification that humanity eventually evolved into two separate species (Morlocks and Eloi). The Morlocks were technologically advanced, but had devolved into cannabalism. The Eloi were "perfect" human beings in terms of health and free from want, but had regressed into incurious child-like illiterates. Wells was writing in 1895. Is it any different from today? We may not be talking about social classes (or we call it "class warfare"), but we do talk about haves and have-nots. Robots and further technological advancement will accelerate this vision. How long until you're able to order a Cylon from Amazon? As you say, Augie, it's up to us as individuals to learn and constantly improve ourselves. That way, we continue to use technology (including robots) as tools -- and not the other way around.